"Those who aspire to the state of yoga should seek the Self in inner solitude through meditation. With body and mind controlled they should constantly practice one-pointedness, free from expectations and attachment to material possessions. Select a clean spot, neither too high nor too low, and seat yourself firmly on a cloth, a deerskin, and kusha grass. Then, once seated, strive to still your thoughts. Make you mind one-pointed in meditation, and your heart will be purified. Hold your body, head, and neck firmly in a straight line, and keep your eyes from wandering. With all fears dissolved in the peace of the Self and all actions dedicated to Brahman, controlling the mind and fixing it on me, sit in meditation with me as your only goal. With senses and mind constantly controlled through meditation, united with the Self within, an aspirant attains nirvana, the state of abiding joy and peace in me. When meditation is mastered, the mind is unwavering like the flame of a lamp in a windless place. In the still mind, in the depths of meditation, the Self reveals itself. Beholding the Self by means of the Self, an aspirant knows the joy and peace of complete fulfillment. Having attained that abiding joy beyond the senses, revealed in the still mind, they never swerve from the eternal truth. They desire nothing else and cannot be shaken by the heaviest burden of sorrow. The practice of meditation frees one from all affliction. This is the path of yoga. Follow it with determination and sustained enthusiasm. Renouncing wholeheartedly all selfish desires and expectations, use your will to control the senses. Little by little, through patience and repeated effort, the mind will become still in the Self. Whenever the mind wanders, restless and diffuse in its search for satisfaction without, lead it within; train it to rest in the Self. Abiding joy comes to those who still the mind. Freeing themselves from the taint of self-will, with their consciousness unified, they become one with Brahman." If there is one passage that sums up the Gita, this is it. By experiencing the Atman, the Self, one becomes completely fulfilled, and is thus capable of acting in the world without concern for self. There is nothing left to gain. In Chapter 3, Krishna tells Arjuna that he must practice Karma Yoga, the path of selfless service, in order to achieve his spiritual goal. "The Gita does not present a system of philosophy. It offers something to every seeker after God, of whatever temperament, by whatever path. The reason for this universal appeal is that it is basically practical: it is a handbook for Self-realization and a guide to action. Some scholars will find practicality a tall claim, because the Gita is full of lofty and even abstruse philosophy. Yet even its philosophy is not there to satisfy intellectual curiosity; it is meant to explain to spiritual aspirants why they are asked to undergo certain disciplines. Like any handbook, the Gita makes most sense when it is practiced. As the traditional chapter titles put it, the Gita is brahma-vidyayam yogashastra, a textbook of the supreme science of yoga. But yoga is a word with many meanings – as many, perhaps, as there are paths to Self-realization. What kind of yoga does the Gita teach? The common answer is that it presents three yogas or even four – the four main paths of Hindu mysticism. In jnana yoga, the yoga of knowledge, aspirants use their will and discrimination to disidentify themselves from the body, mind, and senses until they know they are nothing but the Self. The followers of bhakti yoga, the yoga of devotion, achieve the same goal by identifying themselves completely with the Lord in love; by and large, this is the path taken by most of the mystics of Christianity, Judaism, and Islam. In karma yoga, the yoga of selfless action, the aspirants dissolve their identification with body and mind by identifying with the whole of life, forgetting the finite self in the service of others. An the followers of raja yoga, the yoga of meditation, discipline the mind and senses until the mind-process is suspended in a healing stillness and they merge in the Self. Indians like to classify, and the eighteen chapters of the Gita are said to break up into three six-chapter parts. The first third, according to this, deals with karma yoga, the second with jnana yoga, and the last with bhakti yoga: that is, the Gita begins with the way of selfless action, passes into the way of Self-knowledge, and ends with the way of love. This scheme is not tight, and non-Hindu readers may find it difficult to discover in the text. But the themes are there, and Krishna clearly shifts his emphasis as he goes on using this one word yoga. Here he focuses on transcendental knowledge, there on selfless action, here on meditation, there on love. 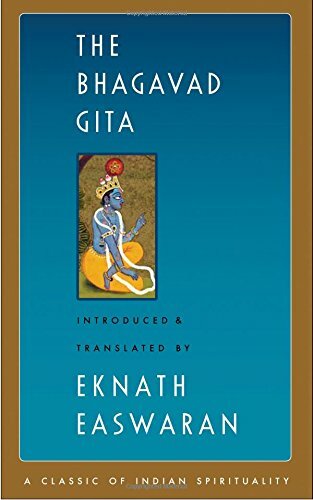 Thus the Gita offers something for every kind of spiritual aspirant, and for two thousand years each of the major schools of Indian philosophy has quoted the Gita in defense of its particular claims. This fluidity sometimes exasperates scholars who feel the Gita contradicts itself. It also puzzled Arjuna, the faithful representative of you and me. 'Krishna,' he says at the beginning of Chapter 3, 'you've been telling me that knowledge (jnana) is better than action (karma); so why do you urge me into such terrible action? Your words are inconsistent; the confuse me. The me one path to the highest good.' (3:1-2) No doubt he speaks for every reader at this point, and for those who go on wanting one path only, the confusion simply grows worse. 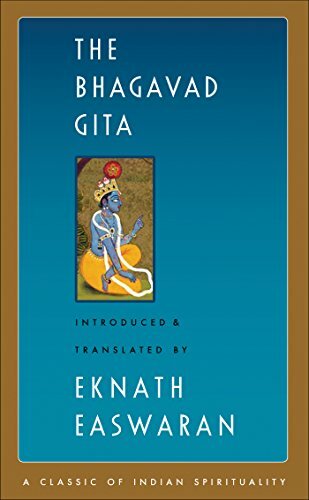 For those who try to practice the Gita, however, there is a thread of inner consistency running through Krishna's advice. Like a person walking around the same object, the Gita takes more than one point of view. Whenever Krishna describes one of the traditional paths to God he looks at it from the inside, extolling its virtues over the others. For the time being, that is the path; when he talks about yoga, he means that one particular yoga." "At the beginning of time I declared two paths for the pure heart: jnana yoga, the contemplative path of spiritual wisdom, and karma yoga, the active path of selfless service. One who shirks action does not attain freedom; no one can gain perfection by abstaining from work. Indeed, there is no one who rests for even an instant; all creatures are driven to action by their own nature. Those who abstain from action while allowing the mind to dwell on sensual pleasure cannot be called sincere spiritual aspirants. But they excel who control their senses through the mind, using them for selfless service. Fulfill all your duties; action is better than inaction. Even to maintain your body, Arjuna, you are obliged to act. Selfish action imprisons the world. Act selflessly, without thought of personal profit. ...Every selfless act, Arjuna, is born from Brahman, the eternal, infinite Godhead. Brahman is present in every act of service. All life turns on this law O Arjuna. Those who violate it, indulging the senses for their own pleasure and ignoring the needs of others, have wasted their life. But those who realize the Self are always satisfied. Having found the source of joy and fulfillment, they no longer seek happiness from the external world. They have nothing to gain or lose by any action; neither people nor things can affect their security. Strive constantly to serve the welfare of the world; by devotion to selfless work one attains the supreme goal of life."